Diversification has long been recognized as a risk-management tactic for retirement portfolios. In fact, the Employee Retirement Income Security Act of 1974 mandates that fiduciaries who manage retirement assets diversify plan investments in order to minimize the risk of extensive losses. By diversifying across a mix of both higher and lower-risk securities, portfolio performance is generally more restrained from both the highs and lows of market swings and may provide more consistent returns. A study conducted by Morningstar revealed that, over time, the average performance of an investor prone to buy and sell based on market conditions tended to trail that of a well-balanced buy-and-hold investor. A second reason to invest in a diversified portfolio is to reduce the recovery time after a market downturn. 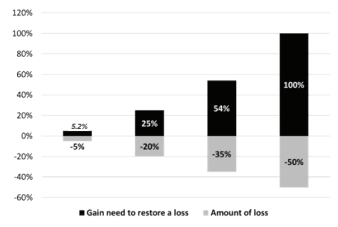 After all, the worse the losses, the longer it takes a portfolio to recover. This can be illustrated through a simple mathematical calculation. A third reason advisors frequently recommend diversifying as an investment strategy is that, from a psychological point of few, the pain people feel when losing money is typically more pronounced than the joy they feel with portfolio gains. Even people who are comfortable investing aggressively are bound to be aggrieved by losses. Therefore, diversification is not just an investment strategy; it’s a way to help investors control mood swings that may parallel the direction of the markets. In short, a diversified investor may feel more confident about his or her long-term prospects for meeting financial goals. For some folks, it’s not just about meeting their investment objectives — but doing so with less market-induced stress. ffers the benefits of diversification, recognize that this is not a one-time event. You should monitor the progress of all of your financial assets to help ensure they stay on track to meet your goals. Because market returns often throw a prescribed asset allocation strategy out of whack, you should maintain the careful mix of asset class percentages aligned with your tolerance for risk, and don’t be afraid to periodically rebalance your assets (sell out-performers) to retain your strategy. Also, you will want to assess your diversification strategy across all of your investment accounts (e.g., 401(k), IRA or investment portfolio, etc.) to ensure that many of your holdings do not overlap — which can negate the benefits of diversifying. It is generally a good idea to work with a financial advisor to help you keep track of all of the moving parts in your financial portfolio.